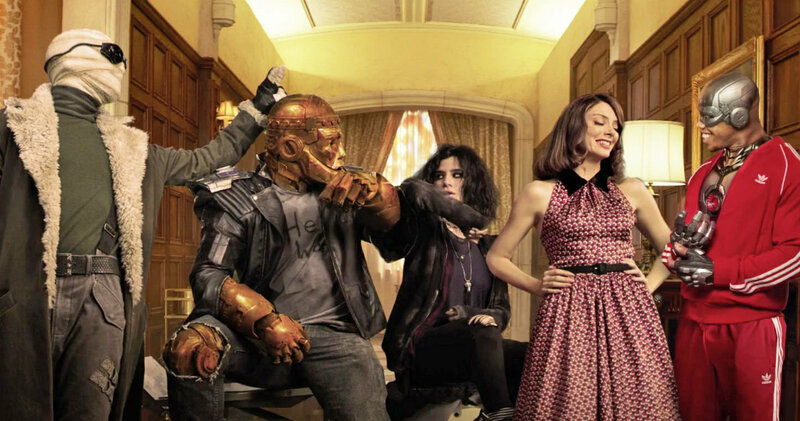 Doom Patrol Episode 7 Review: "Therapy Patrol" – AiPT! Doom Patrol Episode 7 Review: "Therapy Patrol"
The team is at each others’ throats (even more than usual)! What’s going on? And exactly why is Cliff insane now? Wow, there was a lot to unpack in this episode. After the genuinely spooky shenanigans of last week, it was a given that the gang would need to get things off their chests and decompress from the experience. However, I didn’t expect to get so much of that all at once. It’s a testament to this show’s excellent pacing that the fallout from the visit to the original Doom Patrol wasn’t strung out over several episodes. This allowed the team members to open up to one another (and by extension, the audience) in new ways, while still forwarding the season-long arc of Mr. Nobody’s sinister machinations. The quick dives into everyone’s pasts that we get this week illuminate so many of the character flaws we’ve seen in our heroes. Rita’s bizarre poise and manner of speech was hammered into her at an early age by overbearing stage parents. We learn in this episode that “Rita Farr” is her stage name, effectively making her rejection of her acting persona in the previous episode a completely new start for her. It’s no wonder that she’s falling apart throughout this week’s episode; her mantra of “the person who is breathing is me” can’t mean anything to her if she no longer knows what she means by “me.” The only way she can pull herself back together is by embracing what she has become and learning to move forward. We see the first hints of that in this episode and it’s very exciting. Seeing Rita’s gradual evolution from self-involved shut-in to bonafide superhero is one of the greatest pleasures of this show, and it’s being done so wonderfully. The only drawback to Rita’s soul-searching sequences is the presence of a little bit of dodgy CGI. The morphing effects look pretty solid in some of the darkly-lit scenes (the scene in the basement looked pretty great), but they tend to get a little iffy in brighter areas. Meanwhile, Larry and the spirit inside of him get a little closer the more honest Larry allows himself to be. He’s had the idea that his homosexuality is a sin, that it will make the people he loves “lose everything,” as his mom says, driven into him from an early age. Because of this, he’s never allowed himself to be happy. This picks up on a thread from a recent episode, where Larry hears the spirit say “torture,” assuming it means the spirit wants to torture him. It’s beginning to seem more and more like that spirit actually wants Larry to stop torturing himself, which is a beautiful take. It would have been so much easier for the writers to make the spirit into a monstrous entity, but the level of nuance on display here ultimately does both of the characters more justice. It also leads to the best scenes of the episode, as Matt Bomer and Kyle Clements as Larry and John/the negative spirit imbue their characters with a sincerity that is simultaneously passionate and understated. These scenes are perhaps the sweetest the series has seen in regards to Larry. Speaking of sweet, the characterization of Cyborg has come a long way since his introduction to the series. This episode tackles his outsider feelings in a different way, by showing his attempts at rejoining the dating scene. These scenes bring out a boyish charm in Jovian Wade’s performance as Vic Stone that he hasn’t quite been allowed to display in previous episodes. So much of Vic’s screen time has been dominated by his need to take charge and be a superhero. It was nice to see him looking unsure of himself, even annoyed with his own shortcomings and discomfort. It may be due to the fact that we already saw a good chunk of her past in the Decreator two-parter, but the place where this episode feels kind of lightweight is in its handling of Jane’s part of the story. In particular, the shifts between her personalities were a little harder to delineate. They’re usually a little more obvious in cosmetics or an accompanying effect. These effects were still present in this episode, but they were less clear, leading to a couple of moments where it was difficult to tell where Jane ended and Hammerhead or the Hangman’s Daughter began. They both seemed to have the same level of abrasiveness in this episode. Still, it was great to see her genuine concern for Cliff and her attempts to patch things up with him before it all blew up in her face. Speaking of Cliff, this episode deserves a special shout-out to Riley Shanahan, the actor inside the Robotman suit. Cliff spends much of this episode on the fritz, so the extra little tics and twitches Shanahan used to convey that were impressive. The fight between Vic and Cliff, while brief, was really well-done. It can’t be easy to do wrestling moves in a bulky metal costume, but the stunt team and the actors really sold the tussle. I feel like I haven’t been that impressed by practical suit fighting like that since the first Teenage Mutant Ninja Turtles film. This episode may have also featured Brendan Fraser’s best vocal performance since the series began. He’s always impressive in the live action sequences and perfectly sells Cliff’s sad-sack nature and constant confusion in the face of cosmic evil. However, he’s in the unenviable position of having to vocally portray this character while saddled with an in-canon voice pattern that was created from a drunken voicemail. This episode has Robotman in a more frenzied state than we are used to seeing him, so the wavering inflections and hurried, manic speech also aided in communicating throughout the episode that something is off with Cliff (well before we find out exactly what’s wrong). While there were a few inconsistencies here and there, this was a solid installment that got us further into the heads of our heroes. The repercussions of this one will likely be felt in the series going forward. Join me next week for “Danny Patrol,” in which we presumably meet one of the odder characters in the Doom Patrol universe! This episode succeeded in letting the action take the backseat, giving us our most character-focused episode in weeks.